We’re overworked, we’re stressed, we’re stressed in our relationships or not having one! We even struggle to get 8 hours of sleep and spend less time doing the things we love. We lose ourselves in this fast-paced and demanding world. How do we even find the time to read this blog and get our groove back? The key is time. How much time do we allow ourselves to experience absolute happiness? Whether it is taking a 90 minute restorative yoga class, meditation at the comfort of your home or a bubble bath sipping on a glass of good old red wine. The foundation of self-confidence is self-love and we need more of it to experience sustainable confidence. If you’re not looking forward to work or trying to find a way to look fab on your first date, wear a bright, pop colour and it doesn’t have to be your whole outfit. It can be as simple as wearing that fuschia pink lipstick, a pair of electric blue heels or a jungle green scarf. Give it a go and try a colour that you haven’t worn before or have been wanting to wear and see how it can elevate your mood when you get the chance to check yourself out in the mirror. 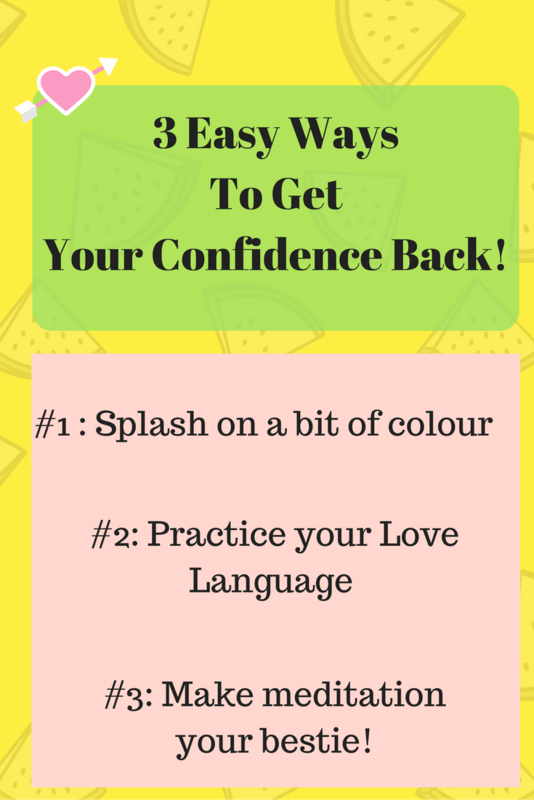 It only takes a few seconds to do and you may even get compliments too! Start the day by reading the same affirmation 5 times to yourself. Research shows that there is neural evidence that self-affirmation can remind us of gratitude, creates a foundation in our self-worth and has a beneficial notion to prompt the brain to recognize reward and pleasure. This only takes a minute whether it is before you get ready for your next date or catching the train into work. Fit a minute into your schedule to do something good for yourself. Find an affirmation on google, there’s plenty of them out. Pick one that resonates with you. Having a bad day or date? Try listening to a guided meditation app like Headspace. It takes 10 minutes and all you need to do is to close your eyes and allow yourself to be transported to mindfulness. An article on vitamin brand, Blackmores mentioned that we should be meditating 40 minutes a day! The benefits of meditation can minimize stress levels and improve cognitive function in the brain. Once you have found it easier to meditate through guided meditation, check out chanting mediation or experience a gong shower at a Kundalini Yoga class for further relaxation and eventually you would be able to meditate on your own in no time.